The "Trump rally" isn't over yet. As the big market indices hit new all-time highs for another straight month, some notable winning sectors are emerging. No surprise, they're all sectors that stand to benefit from policies that President-elect Trump plans on undertaking when he's sworn in as the country's 45th President next month. One of the biggest winners has been the industrials sector, which has been boosted by the one-two punch of pro-U.S. manufacturing policies and a massive infrastructure plan under a Trump administration. Since Election Day, the Industrial Select Sector SPDR ETF (XLI - Get Report) is up about 8% on a total returns basis - just for a little context, that's a pace would put the sector on track for 176% gains if it kept up for a full year. More importantly, there's still a lot of potential upside left in the industrial sector this week, as a handful of big industrial stocks push into breakout territory this December. Regardless of which side of the political aisle you sit, these are the stocks you want to own as we head into the final stretch of the year. To decipher which sector components are the most attractive here, we're turning to the charts for a technical look at five industrial stocks that are breaking out. First on our list is CAE (CAE - Get Report) , a $4 billion training stock that straddles several industries in the industrial sector: namely civil aviation and defense. CAE has been a strong performer all year long, rallying more than 32% so far since the calendar flipped to January at the start of the year. But don't worry if you've missed out on that price move - a breakout move in November is signaling a second leg higher in this stock. CAE spent most of the fall forming a textbook example of an ascending triangle pattern, a bullish continuation setup formed by horizontal resistance up above shares at $14.50, and uptrending support to the downside. Basically, as CAE bounced in between those two technically important price levels, shares have been getting squeezed closer and closer to a breakout through that $14 price ceiling. The breakout happened at the end of last month, and shares have been consolidating just above that breakout level ever since. That breakout clears the way to further upside in CAE. 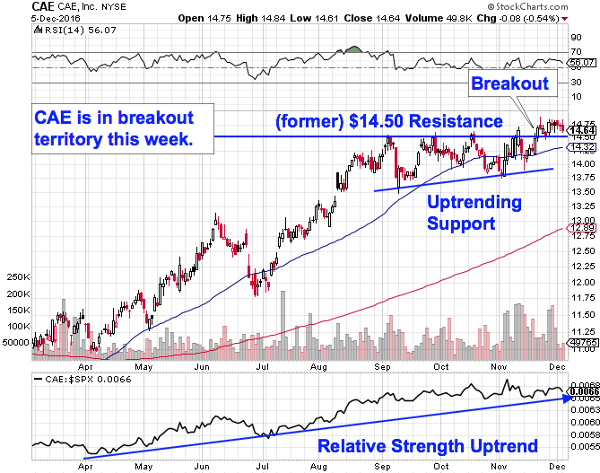 Relative strength, down at the bottom of CAE's price chart, provides an additional piece of evidence for the breakout. 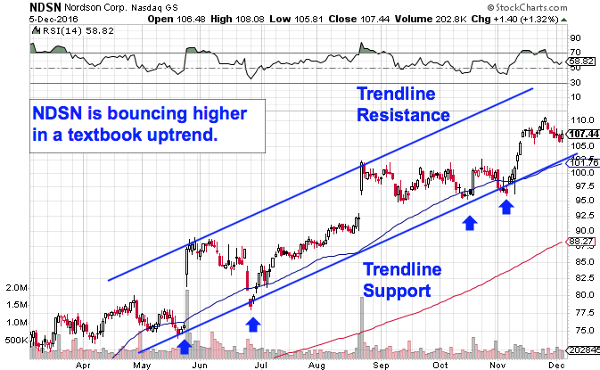 Our relative strength line, which measures this stock's outperformance versus the rest of the broad market, has been in a well-defined uptrend since the start of the year - as long as that uptrend in relative strength remains intact, CAE is statistically more likely than not to keep on outperforming. If you decide to buy CAE here, it makes sense to park a protective stop on the other side of prior support at $13.75. We're seeing the exact same price setup in shares of MDU Resources Group (MDU - Get Report) -- albeit in the shorter term. MDU is an infrastructure and energy play, positioning that gives this stock exposure to two different sectors that are getting buying pressure in the Trump rally. Like CAE, MDU Resources is currently showing off an ascending triangle pattern, in this case since the middle of November. For MDU, the breakout level to watch is resistance up at $28.50. What makes that $28.50 level so important for MDU Resources? It all boils down to buyers and sellers. Price patterns, like this ascending triangle setup, are a good quick way to identify what's going on in the price action, but they're not the ultimate reason shares are starting to look attractive here. Instead, the "why" comes down to basic supply and demand for MDU's shares themselves. The $28.50 resistance level is a price where there has been an excess of supply of shares; in other words, it's a spot where sellers have previously been more eager to step in and take gains than buyers have been to buy. That's what makes a breakout above $28.50 so significant. The move means that buyers are finally strong enough to absorb all of the excess supply above that price level. Shares are within striking distance of that breakout level, but they're not quite there yet, as of this writing. Wait for a close above $28.50 before you buy MDU. Automation and electric equipment maker ABB (ABB - Get Report) is getting a shot in the arm this fall, showing off the potential to add to the nearly 20% rally that shares have enjoyed so far this year. ABB peaked back in October, correcting hard on the heels of its third quarter earnings call - but industry tailwinds look like they're reversing that drop in December. Here's how to trade it. From its correction lows set back in late October, ABB is forming a double bottom pattern, a bullish reversal pattern that looks just like it sounds. The double bottom is formed by a pair of swing lows that bottom out at approximately the same price level - the buy comes on a push through the peak that separates the lows. 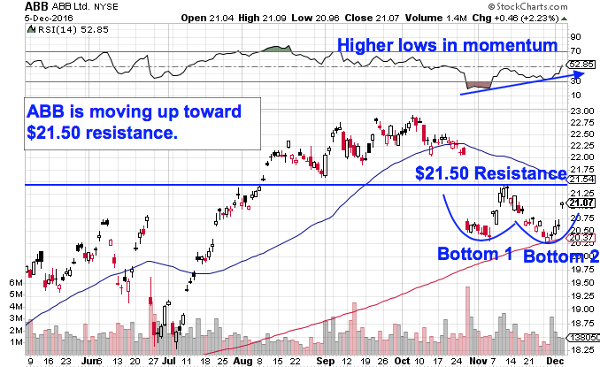 For ABB, that breakout level to watch is resistance up at $21.50. Price momentum, measured by 14-day RSI at the top of ABB's chart, adds some extra evidence that buying pressure is building right now. Our momentum gauge made a pair of higher lows during ABB's twin price lows, a bullish divergence that indicates buyers are stepping in behind the scenes. That adds some extra credence to pulling the trigger on ABB once it musters the strength to move above $21.50. The good news is that you don't need to be an expert trader to figure out what's happening with shares of $6 billion adhesive dispensing equipment maker Nordson (NDSN - Get Report) . Instead, the price action in this big industrial stock is about as straightforward as it gets. Since May, Nordson has been bouncing higher in a well-defined uptrend - and it's still a "buy the dips stock" this December. Nordson's uptrend is formed by a pair of parallel trendlines that have done a good job of defining that recent trading range for shares. The last four tests of trendline support along the way have resulted worked out with higher moves in shares - and shares are retracing down towards a fifth test of support in December. The next bounce off of support is the buy signal to wait for in shares of Nordson. Actually waiting for that bounce is important for two key reasons: it's the spot where shares have the most room to move up before they hit resistance, and it's the spot where the risk is the least (because shares have the least room to move lower before the channel breaks, invalidating the upside trade). Remember, all trend lines do eventually break, but by actually waiting for the bounce to happen first, you're ensuring Nordson can actually still catch a bid along that line before you put your money on shares. Last on our list of industrial sector trades is $24 billion timber company Weyerhaeuser (WY - Get Report) . Weyerhaeuser's business is split into two parts: a timberland real estate investment trust, and manufacturing industrial wood products like lumber. After what's largely been a sideways trading year for Weyerhaeuser, it might seem like not much is happening in this big timber stock, but that's far from true. Weyerhaeuser is actually showing off a twist on a classic "bottoming" pattern here, signaling a potential breakout buy signal on a move through $32. The pattern on Weyerhaeuser's chart is an inverse head and shoulders setup, a price setup that signals exhaustion among sellers. The inverse head and shoulders pattern is formed by two swing lows that bottom out at approximately the same level (the shoulders), separated by a lower low (the head). 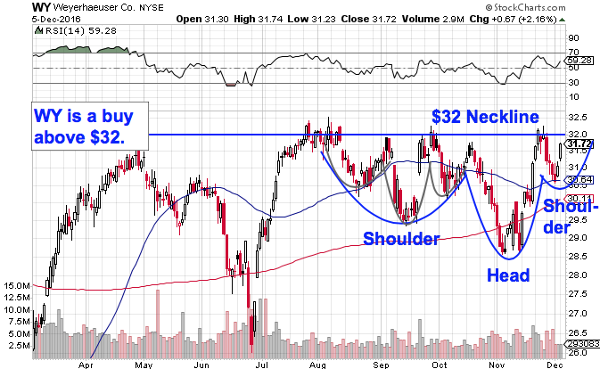 The buy signal comes on a move through WY's neckline, at the aforementioned $32 level. 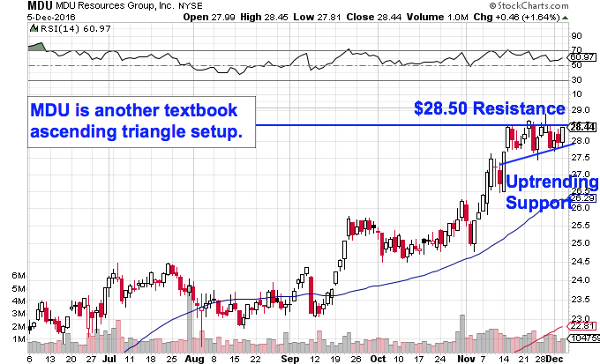 The price pattern in Weyerhaeuser isn't completely "textbook". That's because the inverse head and shoulders pattern is usually a reversal pattern that comes at the bottom of a downtrend, not something that shows up after a prolonged sideways period. But even though this stock isn't textbook, it's tradable. Wait for Weyerhaeuser to catch a bid above $32; once it does, we've got our signal that buyers are back in control.